More often than not, I “improv” our weekday supper menu. Existing foodstuffs are re-constructed into interesting meals (mostly). This particular combination was so good that we’ll do again, altogether or in pieces and parts. First, I had leftover steamed plump mussels from scrumptious chowder and I wanted to present them as themselves, as opposed to immersing them in another mélange. Second, I had planned on making quinoa cakes based on ideas from Martha Rose Schulman’s Recipes for Health column in the New York Times, which basically cook the quinoa long enough to release the starches so the grains stick together, but as mine turned out, not really, aargh! I also had a slice of organic cabbage and a fennel bulb saved in the refrigerator since the fall harvest. And I had the memory of reviewing Becky Selengut’s wonderful book, Good Fish. 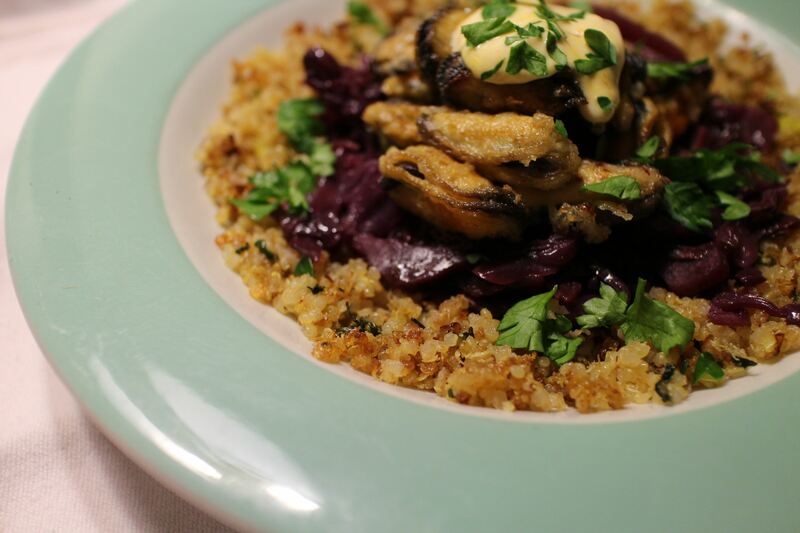 After considering this and that, I made Becky’s fried mussels atop rosemary-infused braised red cabbage and fennel, and served that that over stir-fried quinoa. Topped with a lemony saffron mayonnaise that resembles aioli (but has no garlic), this was a fantastic combination of textures and flavors. Braised red cabbage is a staple around here, typically made as a large batch and frozen. That version requires sliced red cabbage, onion, apple, and plenty of red wine, all simmered for a couple of hours. No time for that, obviously, but Becky has a 30-minute version that, if you were making the quinoa from scratch and steaming the mussels, would dovetail nicely in the supper schedule. It was a little crispier than the long-cooked version, but that was fine with the rest of the ingredients. Heat olive oil in a large saucepan over medium-high heat, add the remaining ingredients and stir well. Reduce the heat to low, cover the pan and cook, covered, for 30 minutes, Stir occasionally. In a small bowl, soak the saffron, chili powder and salt in the lemon juice for 10 minutes.